Spring is passing me by. I’m so utterly immersed in projects for my cookbook that I’m nearly missing the magnolias blooming outside. Fortunately, Cookie always reminds me to slow down for a minute. She starts pouncing on me every evening as the sun goes down, in her persistent, borderline desperate, but always cute sort of way. “Hey! Hey hey hey! Hello in there! Let’s go outside!” She gets her walk, and I catch some blooms as the sun sets. I’ve also been forgetting to eat breakfast, which is a dangerous game. I got a big slap on the wrist for it last week, when I was photographing food and had to pause and sit down for a while. Shaky, lightheaded, sweaty—hypoglycemia symptoms are not cute, and never welcome. It was a reminder that I really have to eat well. We all do, or it will catch up with us eventually. My symptoms just come on sooner than most. That’s why I started cooking in the first place. I couldn’t afford to eat out for every meal, but I had to eat well. So, naturally, I had to learn how to cook. Frontier Co-Op asked me how I cook with purpose—I cook with wholesome ingredients, so I’m properly fueled for my days. Then, I find greater purpose in sharing those recipes with you all. I feel good about sharing recipes that make me feel good. As a reminder to eat breakfast, I made some blueberry baked oatmeal for the week. 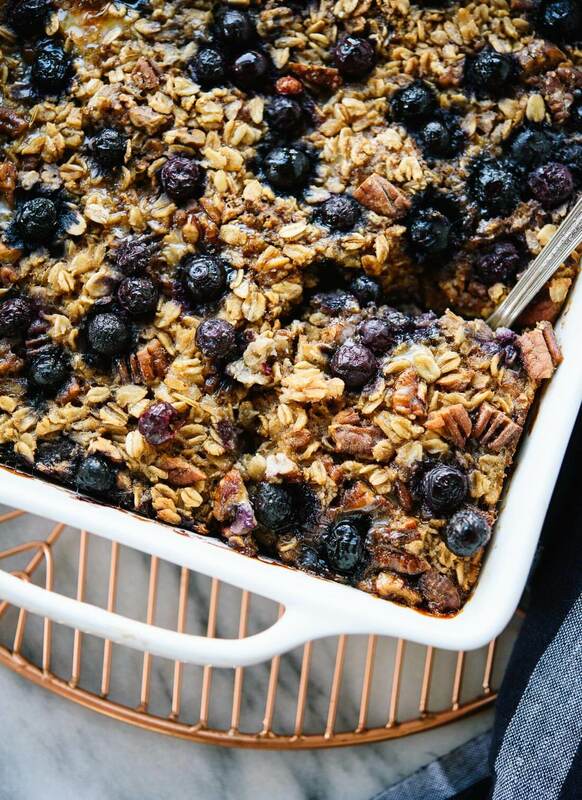 This baked oatmeal recipe is loaded with wholesome ingredients—oats, nuts, maple syrup and blueberries. A couple of eggs bind it all together, and a light drizzle of butter on top makes it taste like a treat. 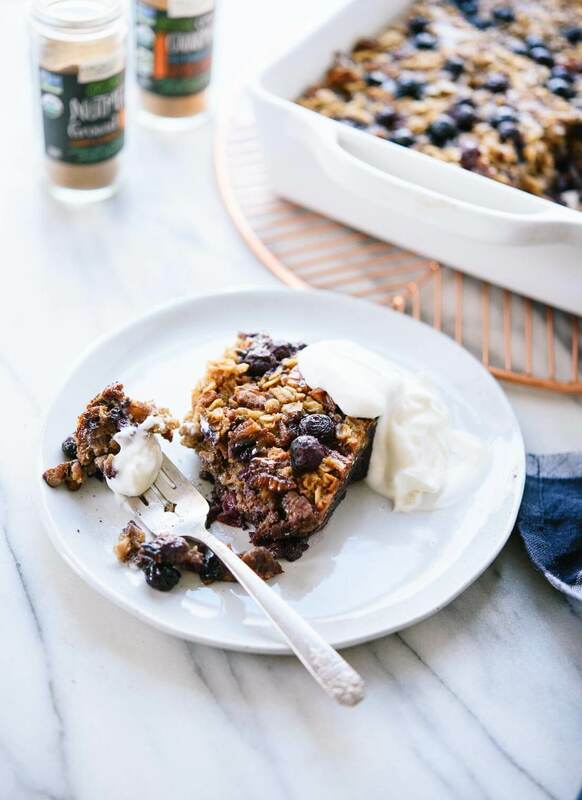 This baked oatmeal keeps me full all morning long, especially when I serve it with a big dollop of Greek yogurt. I loved it as written below, but the recipe is highly adaptable. I used frozen blueberries (right from the bag), but you can use any fruit you’d like. You could also change up the nuts and spices. I’m thinking an apple version would be great in the fall, and raspberry-banana might be fun with cashews and coconut milk in the summer. I used Frontier’s cinnamon, nutmeg and vanilla. I love that their spices have stories that you can trace back through their labels. Like, the Fair Trade ceylon cinnamon that I used in this recipe came from a co-op of farmers in Sri Lanka. The vanilla comes from Madagascar, where Frontier helped dig 49 wells to provide clean water to nearly 25,000 people. Please let me know how you like this recipe in the comments. I hope it becomes a staple in your kitchen, too! 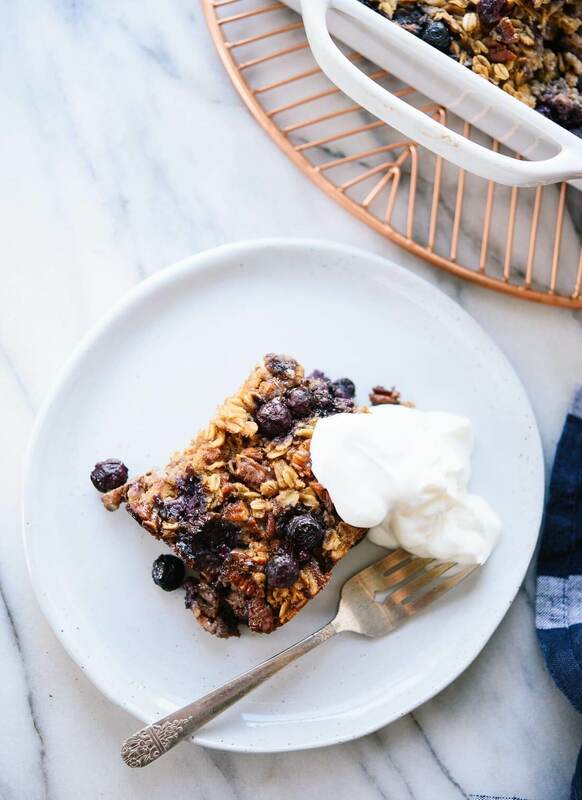 This naturally sweetened baked oatmeal recipe features blueberries (or any fruit you’d like), wholesome oats, nuts and warming spices. You can bake some now and enjoy oatmeal for the rest of the week! Recipe yields 6 to 8 servings. Bake for 42 to 45 minutes, until the top is nice and golden. Remove your baked oatmeal from the oven and let it cool for a few minutes. Drizzle the remaining melted butter on the top before serving. 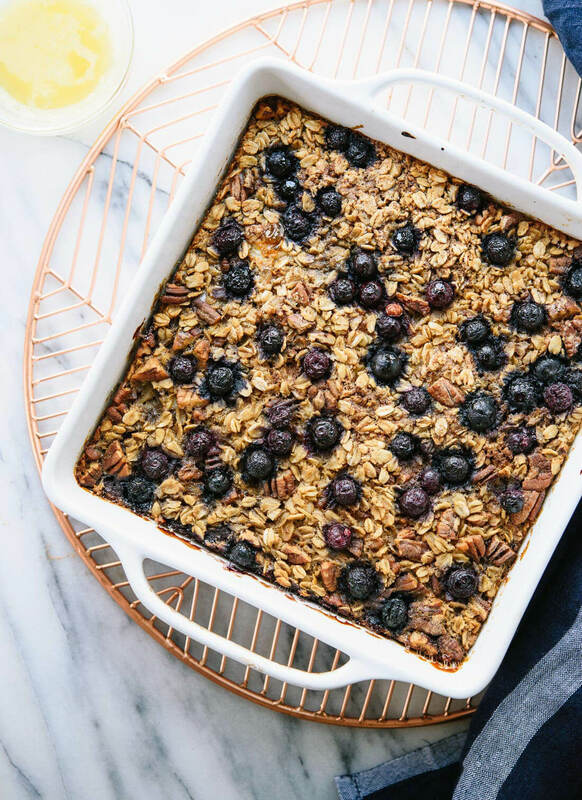 I prefer this baked oatmeal served warm, but it is also good at room temperature or chilled (I’ll leave that up to you!). This oatmeal keeps well in the refrigerator, covered, for 4 to 5 days. I simply reheat individual portions in the microwave before serving. Recipe adapted from my baked oatmeal with blackberries and bananas, which was originally adapted from Super Natural Every Day by Heidi Swanson. Make it vegan: Use non-dairy milk, flax eggs and coconut oil. 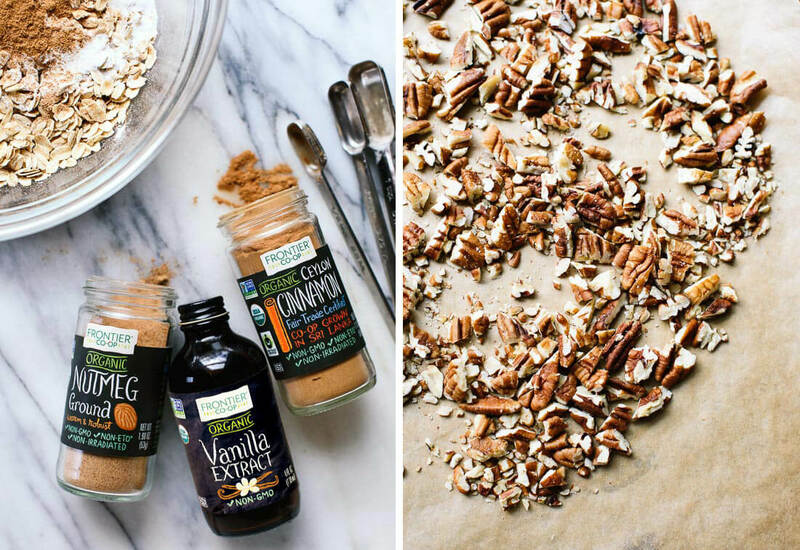 Make it nut free: You can skip the nuts, or use pepitas (green pumpkin seeds) instead. This post is sponsored by Frontier Co-Op and I received compensation for my participation. Opinions are my own, always. Thank you for supporting the sponsors who support C+K! 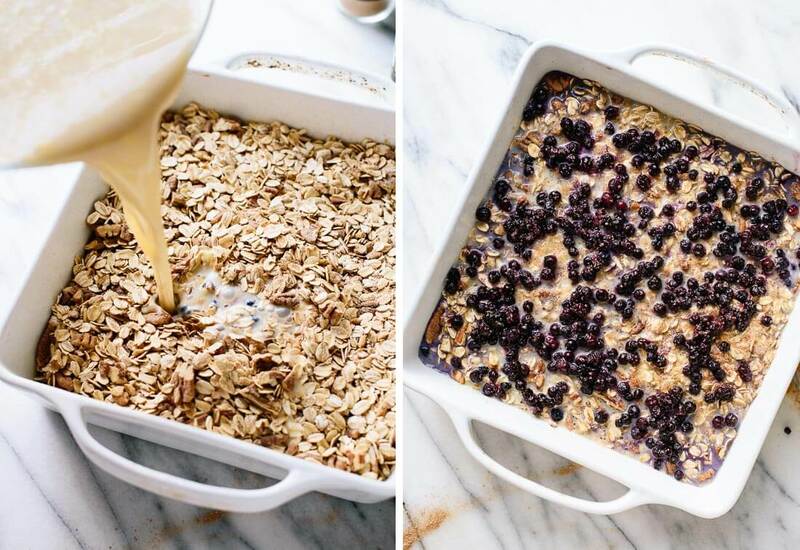 This is a delicious baked oatmeal! Made it with frozen blueberries. The toasted pecans are a terrific addition. Also used Lecanto brand sugar-free maple flavored syrup. Love it and my husband also loved it. I am looking forward to trying it with grated apple next. Let me know what you think of grated apple, Robin! Oh man this is good! You can eat it for dessert, breakfast, or a snack, or all three! I skipped the nuts, sugar, and used only 2 tbsps of honey. It is still sweet. I think you could use some par baked apples, raspberries, blackberries or strawberries and this would be good. I am planning to make this for a baby shower I am hosting next month! Right! It’s so versatile. :) Thanks for sharing, Michelle! I agree, Dana! Thanks for your review. This recipe looks delicious, I’m trying it soon! Do you think I can use quick-cooking rolled oats? This recipe is wonderful. I used Bob’s Red Mill Gluten-Free Quick-cooking oats and it came out fine. I also replaced the maple syrup/honey with 1/4 cup of Navitas Coconut Palm sugar, which has a lower glycemic index. You might need to adjust the cooking time, so make sure to keep your eye on it. Could I double the recipe in a 9×13 dish? I have A LOT of people to feed at an event coming up and they’re looking for breakfast items. I searched for a Paleo option and loved what you provided. I just did this for a girl’s weekend. It came out great! Everyone loved it! I cooked it between an hour to an hour and fifteen minutes until the top was a nice golden brown. We have been making a 9 by 13 dish of it every week. It is a wonderful recipe. I haven’t tried it, sorry! You could try it. You just want to keep an eye on it and may need to adjust the timing. 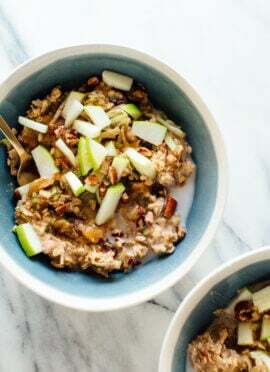 What a wonderfully different way to have oatmeal! My second batch is in the oven now. Perfect way to warm the house on this cold day I’m ChIllinois! Thank you! You’re welcome, Brianna! Thanks for your review. I have tried several recipes for Baked Oatmeal. This recipe is definitely the best that my husband and I have tried. Other recipes are just too darn sweet. I made it with apples and walnuts and Blueberries and walnuts. Both were delicious! Our favorite breakfast in the Winter. My husband likes milk and I prefer a bit of plain yogurt on mine but delicious either way. Thank you for a great recipe!! Hooray! Thank you, Frances. Delighted to hear that you like this recipe the best! This was bland and mushy. The whole thing ended up in the trash. It was a waste of ingredients. I’m sorry you didn’t love this. Thanks for your feedback, Spencer. This is a great recipe, perfect ratios! I switch up the fruits, nuts and seasonings every time I make it (mixed berries with orange zest and ginger currently baking). I make it on Sunday and it’s my go-to breakfast for the week. Thanks for sharing! I love it, Jacqueline! Thanks so much for sharing. I made this with frozen mixed berries and it’s amazing! I love it and it’s so easy. I’ve given the recipe to quite a few people – thanks for sharing! Happy to hear you loved it, Kelly! Would love to try this out, however I’m not sure how my family would like it. Can I half this? I don’t think this would work very well halved. You can make it for the week. It does make great leftovers! I’m sorry to hear this didn’t turn out for you. Did you give the dish a gentle wiggle? I tried commenting but my post was removed. Is it because mine didn’t turn out? Hi Lamia, I’m not sure what happened with your post! I was having some website concerns. I’m sorry this one didn’t turn out for you. What size baking dish did you use? Pouring gradually over the mixture and then gently shaking the dish should have done the trick. Hi Lamia, I’m not sure what happened with your post! I was having some website concerns, but should be fixed now. I’m sorry this one didn’t turn out for you. What size baking dish did you use? Pouring gradually over the mixture and then gently shaking the dish should have done the trick. Wonderful, Antoinette! Thank you for sharing. Would it work to make this ahead and freeze? I haven’t tried to freeze this. I’m not sure how well it wold freeze with the milk and oatmeal. It does reheat nicely through the week, though! 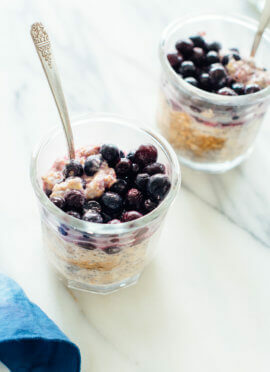 Awesome- I love oats but it was getting messy (and boring) bringing overnight oats to class. This was great! I actually did half it and used coconut sugar and almond/coconut milk with quick oats and it turned out great. Even with the half recipe, I found it took ~40 minutes to bake. I’m glad this was just what you were looking for to help change things up. Thanks for sharing, Gina! I love this recipe! I like it warmed with a little Greek yogurt on top. Is it bad I’ve eaten almost the whole pan in 3 days???? No judgement here! I’m really glad you love it, Kim. Thanks for your review. Thanks, Ken! I’m glad you liked it. Made it today. We LOVE it with greek yogurt! Can’t wait to have it again this week for breakfast. That’s a great way to serve it, Clare! Thanks for sharing. Hello! Is it possible to assemble this the night before, leave it in the fridge overnight and bake the next morning? Many thanks! Hi Ansley! I wouldn’t recommend it for this recipe as the oats will start to soak up the liquid as it sets over night and I can’t guarantee the result. Sorry! Congratulations on the two babies! Thanks so much for sharing, Lindsay. I’m really glad you like this one. Hi Carly! Feel free to cut the amount of salt if you needed. I would still use some syrup, but you can decrease the amount. This recipe is amazing! I have made it several times for breakfast potlucks. I get asked for the recipe every time, and rarely do I have leftovers. I have changed it up every few times I make it. I have tried it with blueberries, apples, and raspberries. I also have mixed the honey and the syrup instead of using just one. Such a versatile recipe and so delicious! Thank you! Your recipes have been such a help as our family cut processed sugar out of our diet last year. Love your recipes!!! Thanks again! I”m so happy to hear that! Thank you for sharing, Bethany. Hello. I tried this recently and it was quite mushy and cake like. I think that maybe I was a bit off with the proportions of wet to dry ingredients, do you think that could be why? It looked much wetter than yours once I had poured the wet ingredients in. I didn’t have any nuts so maybe that threw the proportions out. Help would be appreciated! Hi! I made this recipe but I didn’t love it because it was pretty eggy at the bottom. Is that expected or did i do something wrong? Hi Jane! I’m sorry you didn’t love this one. That doesn’t sound right. Did you put in the blueberries, then oatmeal and then pour over the wet mixture with a gentle wiggle of the dish to distribute? I love toasted almonds with blueberries but if I use pecans I prefer bananas, so I simply follow the recipe and leave the fruit out, then top each piece with freshly sliced bananas. This is the *best* baked oatmeal recipe I’ve ever tried, and I’ve made no less than 12, trying to find the perfect balance of not too dry, not too wet and not too sweet. 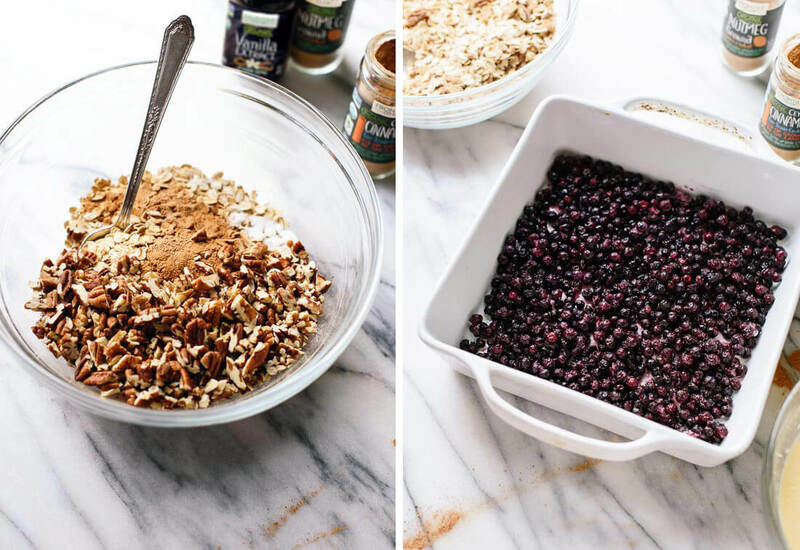 This is seriously the only baked oatmeal recipe you’ll ever need! That’s a lot of baked oatmeal recipes! I’m happy this one works for you, Stephanie. Hi Kate, I am loving this recipe, but getting some solid egg whites in the pan when I band it. Do you have any tips to avoid this? Should I be mixing the wet ingredients with a hand mixer, or are my eggs too cold? Hi Chelsea, happy to hear that the recipe has turned out well for you! I can’t say I’ve run into that before, but yes, it sounds like your egg/liquid mixture should be mixed better. You could do that by hand with a whisk or with a hand mixer. Thank you, thank you, thank you for this delicious, recipe. It is exactly what I have been looking for. 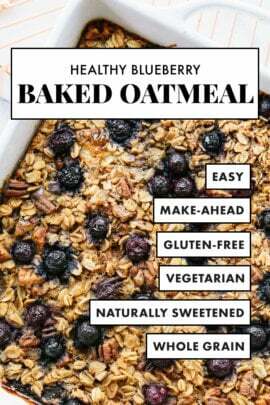 I have low blood sugar too and this is the only oatmeal recipe that has ever stuck with me all morning. I will make it many more times! You are very welcome, Laurie! Thank you for your review. Just made and tasted this in hopes that my two-year-old will eat it in the AM. I was a little nervous, as I omitted the nuts (choking hazard for my little) and used TJ’s jarred peaches. I dried the chopped peaches off with paper towels. Also used almond milk and was, shall we say, GENEROUS, with the butter :) But I shouldn’t have worried–it’s SO GOOD. After making it with such a wet fruit I’m convinced you could use anything in here. Not quite sure about the reviews that didn’t get amazing results–I’m pretty critical of recipes and this one will be going into permanent breakfast rotation for us! Oh, also used coconut sugar on top and drizzled on the butter before baking. Baked it in a glass 3 qt. pan, which was actually really helpful to see that the liquid mixture got all the way down into the oats. Awesome recipe! I’m so happy you loved it, Tessa! Thanks so much for sharing your feedback. I love you could make it work for your little one. I made this oatmeal and super excited to have it for breakfast but accidentally left it out overnight, can I still eat it? I’m sorry to hear that! I wouldn’t recommend it. Bummer! Had some left over baked sweet potatoes. Mashed them and added to the liquid. Then I diced some up very fine and sprinkled them on top. What a pretty color and oh so delicious! I absolutely love this! Even my partner who turns his nose up at regular oatmeal devoured it and has asked if we can have it again for next weeks breakfast meal prep! I made it with blueberries and chunks of apple and it was amazing. Would love to see more fruit variations of this recipe. Tha ls Kate for yet another great recipe! Hooray for baked oatmeal! I like the blueberry and apple combination. Thanks, Breanne! Thank you Kate for a wonderful breakfast recipe. Made it exactly as written , and it turned out delicious. I have some frozen pears that need to be used. Do you think they would work in this recipe?. I’m glad you loved it! I haven’t tried it with pears, but it has worked with other fruit. Let me know if you try it! This was delicious! Any idea what the nutrition facts might be? Hi Eva! The nutrition information is below the notes of the recipe. You need to click to expand and make sure you have cookies enabled as this is a plug-in. 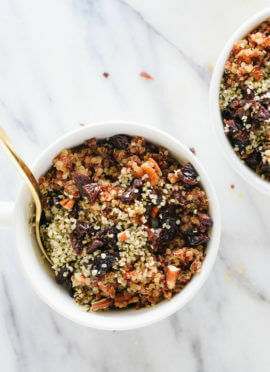 This baked oatmeal is wonderful! The honey and toasted nuts make it warm, comfort food, hard to resist. Everyone wanted my recipe! What consistency should the oats be once baked? First time trying baked oats! Hi Maeve! They will be soft and this version will stick more together. If that makes sense? Thanks for your review! Hi kate – I’ve been making this recipe for years and I love it. I’m curious how you think the recipe would turn out if I swapped steel cut oats for rolled oats? Thanks! Hi Ingrid! I’m glad you love this recipe. I don’t know if steel cut oats would work as well without modifying as the liquid would likely need to be increased. If you try it, let me know how it goes for you! I wonder if I could make this with quinoa? Would I cook the quinoa first? I wouldn’t know without trying it, but sounds interesting!